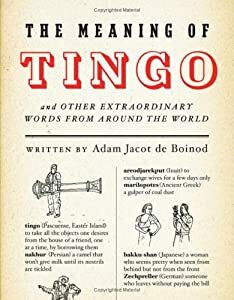 The first Tuesday of each month, I share a word from The Meaning of Tingo & Other Extraordinary Words From Around the World by Adam Jacot de Boiod. Today, I’m sharing an Inuit word. You know that feeling of anticipation when you’re waiting for someone to show up at your house and how you keep going to see if they’re there yet? And, to think, I just thought I was excited! I love when other cultures have language for the actions and concepts for which we haven’t necessarily got the right words. In a moment, I’m going to ask you to leave me a comment. In fact, you can leave multiple comments. Think of this as a contest you can enter as many times as you’d like. Just make each entry a different comment. I will pick the comment I love the most and the winner will get to follow in the shoes of my last winner, Pegoleg. See her over there in my sidebar? Isn’t she cute? Yeah, well she’s consistently funny, too. And prolific! Non-bloggers, I know you are feeling pouty. You’re like: “What about me? I don’t have a blog.” No worries! You can still win. I will highlight your name in bold and let everyone know how smart you are. Oh, and if you happen to be looking for a new job, you can add “uncanny ability to comment on words with no English equivilent” on your resumé. Feel free to direct prospective employers here. I will totally back you up. Tell me the last time you had a (real or fictional) IKTSUARPOK moment. What happened? Who were you waiting for? Was it worth the wait? This entry was posted in Tingo Tuesday and tagged culture, Dictionaries, English language, fun with words, iktsuarpok, Inuit, The Meaning of Tingo: And Other Extraordinary Words from Around the World, words. Bookmark the permalink. This most recent iktsuarpok moment came this morning. I’ve been waiting for motivation to show up and encourage me to get on the treadmill. I’ve checked repeatedly. Thus far, elusive. As always. Think I’ll go visit Pegoleg. Perhaps, motivation is hanging out there. If not, at least I’ll be amused. Hahahaha! Awesome. So you were hanging out waiting for inspiration. 😉 I can so relate. What He was thinking I’m sure: See, if you check anyway, what’s the rush? Since moving to rural NC, I suffered from IKTSUARPOK mania. Run to the window cause I heard the gravel fly only to find out it was nothing. It turned to doing everything next to the window; read, listen to music, stare at my exercise ball gathering dust. Until I had an epiphany: I would outsource my IKTSUARPOK to my canine companions. They have a series of well-trained barks to announce people they know, people they don’t know, and squirrels. I don’t suffer any longer now. How sweet to realize you just needed yourself. Nice to meet you. Coming over to see what you are all about. For the life of me, I cannot think of one iktsuarpok moment. But then again, I’m kind of in a bad place right now, so I’ll think on it and come back. But I like this feature. It’s super fun. And I like finding out new words for already established feelings without a good English equivalent. Fun! Well, feel free to come back when you have figured out an entry. We’re here all week. Or until I can figure out how to make this a featured widget on the side of my page. Which I don’t think I can do on this theme. Which is why I totally need to change themes. Or take a course. But you know what I mean, if you find yourself wandering to the door — come back and let me know. “Iktsuarpok” — that feeling of anticipation when you’re waiting at your blog for someone to show up and comment about how funny that post you just wrote is and how you keep checking to see if they’re there yet. Usually there’s lots more checking than showing up. It’s worth the wait. I guess. I have iktsuarpok moments every time of of my adult kids is coming home for a visit. Their little brother gets so excited that the countdown begins hours before they arrive, and I have to keep telling him how many minutes we must still wait. I get nervous, and giddy, and impatient, just as my little boy does. As time for them to arrive approaches, my heart speeds up and I begin checking out the window, and listening for the sound of car tires on the gravel road. I miss them so much in between visits that it hurts. Once they do arrive, and the second I see their face, I almost always get a little weepy. Together, my little boy go running outside to hug them. Everyone is smiling huge smiles and words are insufficient to describe the feelings of pure joy and happiness. Sometimes my little guy wants to hide and make whoever find him, but he always giggles and gives his location away. Two weeks now—I will get to have another iktsuarpok moment in about two weeks and I cannot wait! When my 2 year old and I got out of my bed, I walked into the living room to see my front door sitting wide open. All I could imagine is that the thieves returned to get whatever they missed the first time. I ran back into my bathroom, locking the door and hugging the little guy to my chest as I called 911. My iktsuarpok moment was waiting for the police to show up at my house. While I wasn’t running to the door repeatedly, I was holding my breath every few seconds hoping the sounds I was hearing were them and not some random thugs. Ooooh! That’s a good one. So you were telepathically iksuarpoking. That is also super scary. We’ve had lots of visitors lately, but my latest iktsuarpok moments were all about the arrival of my baby in August. It wasn’t so much the case of going to the window or listening for the hum of a motor in the driveway. No, my iktsuarpok was comprised of several months’ little pangs. Every time I had a contraction–which happened often while I was teaching _The Odyssey_, for some reason–I’d think THIS IS IT! WOO HOO! And then… nothing. So that final month of contractions was one of major anticipation. A contraction at the stove, making mac and cheese for the kids for the 800th time: WOO HOO! (Nope.) A contraction in the grocery store check-out: WOO HOO! (Uh-uh.) You get the picture. Finally, Ary announced he was coming FA’ REAL, yo. At 2:30 in the morning, on August 1, I woke up with that same ol’ WOO HOO feeling, didn’t give it any merit, went back to sleep. Without getting into details, let’s just say he finally made his way into our crazy, beautiful world just hours later. I get iktsuarpok moments now when my oldest son and his girlfriend come in from college. My son has become a wonderful man — smart, independent, and focused. When he’s home with his brothers he’s still the oldest brother, still the firstborn son. But when he’s with his sweetheart he’s a kind and thoughtful man. And I only get to see this side of him when she’s around. When he was a baby, I vowed to raise him to be a man that women would want to be around. So I get all iktsuarpok when I know THAT guy is on his way! So you wander back and forth to the window, waiting for the man-boy to appear. I love that. LOL. It was last Wednesday morning. My friend and I have gotten together for tea every week (mostly) since our kids were in pre-school together a dozen years ago. That weekly meeting has become more important to me over the years since now I spend all of my time playing with my imaginary friends (writing) and talking to people who live far away on the internet. My friend teaches Spanish part time at a nearby school. She was half an hour late, but I wasn’t sure how to take that because we both keep appointments on Mexico time, i.e. the same hour is on time. Just as I was starting to think I’d been forgotten, she showed up and told me the principal had cornered her as she was leaving the school. Oh Piper! That’s the moment. When you just are sure you have even forgotten. When you feel disappointment: time sliding into past tense and then huzzah! So. Glad. She. Made. It! A few months back, hubby and me attended a play written by a local playwright here in Honolulu. The play was amazingly good, and I wanted to meet with him and pick his brain about his process. We had met many years ago, but I didn’t know if he would remember me, or even answer my email. It was very “iktsuarpok” experience. He did agree to meet with me and it was uncanny, as he is the human embodiment of a character in my novel. Awesome! So while you were waiting, were you checking for him every two seconds? What a cool experience! Waiting for my husband to arrive at the airport baggage claim after he spent 10 days in the mountains recently turned me into a hyper 2-year-old waiting for cake and presents. Yup. Ten days separated from your hubby will do it. I’m all verklempt. I have a serious iktsuarpok moment every day when I wait for Ed McMahon to show up with my big fat check. He isn’t alive though anymore, is he?…so maybe it won’t happen now? My real serious iktsuarpok moment was the first day my son had to ride the bus home. I must have jumped up and ran over to the front door dozens of times when I thought I heard someone coming. The bus was super late and I ended up just pacing nervously back and forth. When the bus finally pulled up I ran across the front lawn holding Julia and waving my arms like a lunatic. Yeah, I was a bit worried about the boy. Omigosh, technically, these are two entries. And you had me at Ed. Maybe even Eh. I can imagine pacing, waiting by the door. Though I never did that. But I know a lot of folks who did. I was the one who cheered when the bus was late. I love words. I love cultural linguistics. I love this idea. I’m quite fond of Peg-o-leg, though I’m not ready to say it’s love. Yet. I am sitting in the world’s most comfortable corner, the crook of the L-shaped sectional sofa.The Scrabble board atop the ottoman that he helped me move last President’s Day provides little distraction from the anticipation of his appearance in the doorway. After all these years, waiting for him still makes me breathless and giddy. Giddy. Forty-something years old and giddy. How ridiciulous. I play with the letters.I-T-K . . .How much longer? . . – S-U-A-R- . . .What am I doing? That’s not a word. . . Finally the door opens and there he stands. Giddy yields involuntarily to breathlessness mixed paradoxically enough with contentment. I mumble the line from that Springsteen song and we giggle. He glances at the ottoman and the grin of a President’s Day memory spreads mischievously across his face. He moves to the Scrabble board and slowly slides the remaining letters into place. . . P-O-K. . .
It’s fictional. Entirely fictional. Well, mostly entirely fictional. Oh, you know he would challenge you and then you’d get 50 points. I don’t know. Are Inuit words kosher in scrabble? I do, in fact, own a Scrabble board, and the sofa is muy comfortable. You would love Peg. Or at least want to make out with her a little. I waited for Jason Mraz to come on stage Saturday night. Well worth the wait and anticipation. Did you keep checking the security guys? You know, to see if they were coming for you? Because, you know, they could have been coming for you at any moment, to pull you up onto the stage. It could have happened. My only Iktsuarpok moment of recent (or distant) memory is waiting for an Iktsuarpok memory to come to mind. Oh, there it is. The last time I experienced iktsuarpok was two Saturdays ago, when I kept looking through the window to see if my wife was back from the supermarket, so that the moment she arrived I could go and help her bring in the bags of groceries. And? What did you eat the moment she got back? Ho-Hos? Greek Yoghurt? Do tell! What a great word! I also have those moments all the time. Lately I’ve passed on the action to my children who stand at the window like puppies when they’re waiting for a friend to arrive. Renee, you ol’ scalawag, I’m delighted to be your pet! I forgot about that Tingo Tuesday win way back when. I was always the teacher’s pet in grade school and I have the emotional/bullying scars to prove it. I am currently all iktsuarpok waiting for you to come to my house and give me a back massage to go with the foot rub – it was diVINE by the way. Also wash my windows, scrub my floors and hang out with me. I understand that all goes with the “pet” thing, right? It’s hard to call mine “a moment”. I’ve been experiencing it for some seven years now, and counting. I keep waiting for my son to make his bed, brush his teeth, and eat his food WILLINGLY. Any day now, is what I keep telling myself. Any day now..
My latest ‘iktsuarpok’ moment would have to be when I released my latest book to the wild. I HATE waiting for reactions. Of course I care what everyone thinks, BUT I have a few readers where their opinion, really, really, really matters to me. Like, really. Omigosh. This is a moment I can only dream of — but I am certain that I would be glued to my computer. I’d have every alert set so that I could know if a new reaction has been added. Of course you care what people think. Your book is your baby. And you made her and let her out into the world. And you want people to think she’s lovely. My recent Iksuarpok moment took me back to my teens. Back-in-the-day, when I waited for a call from my HS sweetheart who said he would call when he got home from work, I didn’t want to leave the house and miss the call. I plucked the phone from my sisters’ hands if they were on the line too long. I repeatedly picked up the telephone to make sure it had a dial tone. What if he tried to call and got a busy tone because of me? Yes. I’d pick it up again to make sure the dial tone was still active. Pathetic, I know. But, I was in L-O-V-E. He had my cell phone number and planned to call when he got home from work (same old line, right?) so we could catch up on our lives between then and now. The cell reception at home is spotty at best. What if he called and couldn’t get through? Remember, he was my first L-O-V-E. I suffered age regression awaiting that call, and actually called MY cell phone from MY land-line to make sure the cell phone worked. Yes. He called. Yes. We had a great chat. There you have it. My Iktsuarpok.Waiting for that call, I acted like the regressed teen I’d been the last time I saw him. Nothing sacred here. No hidden agendas. I am the dolt person who hates to wait. Omigosh! I love that you got all dolled up to sit by the phone. That is cool. My first oh friend and I chat on Facebook all the time. We kissed when we were in 5th grade. We joke about it all the time. Glad it was fun! Our mutual friend sent me… I didn’t know there was a word for that. But I do it too. I just read some comments… there are some whacked out people on your blog… I like that. Tingo Tuesday… what a cool concept. I’m going to back and look. Would that be Susie? If so, I hope you enjoyed her part-ay! I’ll have to come & check you out later! 😉 IYKWIM. That happens. I understand. You should put your glasses on maybe. And Tingo Tuesdays are kind of a movement. Kind of. Did you check to see if someone replaced the toilet paper? Because that would count. I felt so iktsuarpok while I was waiting for Chris Hemsworth to pick me and Michael up so we could all go bowling together, but then it was ruined because Spider-Man spied me and thought I was a wanted cat burgled (SO not my style) and he tied me in a web on the top of the St Louis Arch. Some of the cases take years to gather everything I need, go through all the right legal channels, and then finally nab them and close it up. I feel the need to experience this up close. I’ve sent you my private address via email. Please come. Hurry. I’m waiting. Yes. And I am a good guy, but I am also a bit of a wolf…..
Holy crap! That was cool! You are amazing. I mean, your muscles were rippling! Hey you two, get a room! What’s next – you reenact the Big Bad Wolf/Innocent Shepherdess fantasy? Hi pegoleg! We tried to get a room, but they frown on door-abuse. The muscles weren’t rippling, it was more of a jiggle since I stubbed my boots on the door frame…..
Well, we won’t discuss things that jiggled. Because obviously, my booty is firm. Also, we don’t want to offend my Featured Blogger who already has us in a room. 😉 Yes, it was VERY firm. It broke my momentum if you remember. By the way, you got your season goose early this year! Hahahahaha! I love the Italian Iktsuarpok! 😉 Hilarious, Carl. As usual you nail it in a sentence. Omigoodness. I am so so sorry for your loss. That is not a fun kind of waiting. But it is what it is. Thanks Renee. It was a lovely toast to a remarkable life. I often find memorial services — sad as they are — can be very comforting. I hope it was well attended. May she live in your hearts forever. Gosh, I’m so late to the show. Finally, the book arrived and you know that little swish on the side of an Amazon box? Well, it’s a SMIRK. The book sat on top of my tv, still in the box, because I was afraid to read it and be disappointed. It sat there… smirking. Like it knew I had been waiting for it and was now afraid of it. The last time I had one of those moments was just a week or so ago. I was waiting for Golaat to return from the wilderness. He’d been hunting caribou with Aalor and Bishnik. They’d been gone for several nights, and my supply of whale oil was running frighteningly low. My ice-ferret jerky was nearly gone as well. I went to the wall and pulled back the flap of seal pelt again and again, hoping to see them coming across the ice, but I was greeted with nothing but a bleak landscape of snow, ice and sky. Finally, I was too exhausted to look anymore, and I must have drifted off to sleep. I thought I was dreaming when Golaat appeared before me, his pouch filled with whale oil and his parka glistening with caribou gore. It just goes to show, a watched pot never boils, and no amount of iktsuarpok can make Bishnik, Golaat and Aalor come back to the village one minute sooner. Don’t you freaking hate when you run low on ice-ferret jerky? So glad to hear that everyone returned. And seriously, outstanding! Sooooo glad you came over 1PP! I’ll admit, I was worried but I thought you had Yolgürt with you. So. IKTSUARPOK moments. I am continually waiting for phone-calls, visiters, blog posts, muses, and cookies to come out of the oven! Xxxx Kissssssssss. Love visiting you! *Waiting for that first comment on every blog post I publish. *Waiting for the email that will tell me one of my posts has been Freshly Pressed (a curiously ongoing “iktsuarpok” moment). *Waiting for my daughters to wake up in the morning and cuddle in my lap for those first sleepy, snugly, whine-free, best thing in life hugs. *Waiting for the moment my daughters succumb to sleep and I indulge my love affair with a stack of Oreos and a good book. *Waiting for the sound of the back door opening and my husband returning safely from a business trip (unless, of course, his timing interferes with my Oreo affair). Nice to meet you! I’m so happy you are liking what you see! And I love your thoughtful comment here. I totally (pick me) know that feeling (you like me) but mine is (pick me) more of an anxiety (I’m right here) filled feeling of will they (pick me) come or won’t they come (I have a nice blog) and is my house clean enough. I wonder if (you will pick me) they have a word for that? I think you have captured the Bouncing up and down excitement of the iktsuarpok moment! Coming over to check you out! Try to remain calm. I should be there in about 45-60 seconds. What Perry said! Great idea – I’m looking forward to the next word. Coming over to check you out right now! I’m not sure I have iktsuarpok moments, or perhaps it’s just that I don’t recognize them as such .. but I remember that when we were kids we would always check to see if guests had arrived yet. My mother told me my Opa used to go out to the sidewalk and “look them in” when he was expecting guests.